Somewhere in this country there are 230 homes with mortgage balances between $10 and $20 million dollars. According to a post written by Arthur Jobe in the CoreLogic Insights blog, 75 percent of them were originated since 2013, and 180 represent refinances. Those refinances were largely originated since 2013 as well. These homes are unlikely to be in your neighborhood (or ours) although you would have the best shot if you live in California, home to 55 percent of the super jumbo refinances. Seventeen percent are located in Florida, and smaller percentages (4 to 6 percent) in Massachusetts, Connecticut, New York, and Texas. Of course, even zillionaires like to save money, and adjustable rate mortgages (ARMs) are particularly popular for loans of this magnitude due to their lower initial rates. Roughly 76 percent of borrowers refinancing ARM loans opted to go with another ARM, and 31 percent of those refinancing fixed-rate loans switched to an ARM. The median initial interest rate was 3.25 percent, and most borrowers will see the adjustable period begin by the third quarter of 2024. 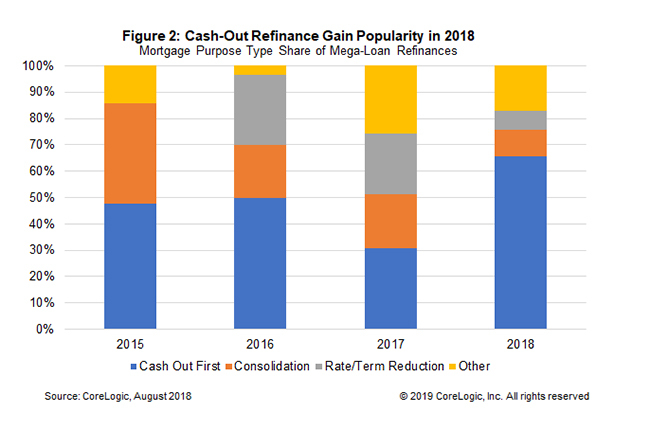 CoreLogic's data shows that half of those refinancing into ARMs decreased their interest rate by an average of 70 basis points. 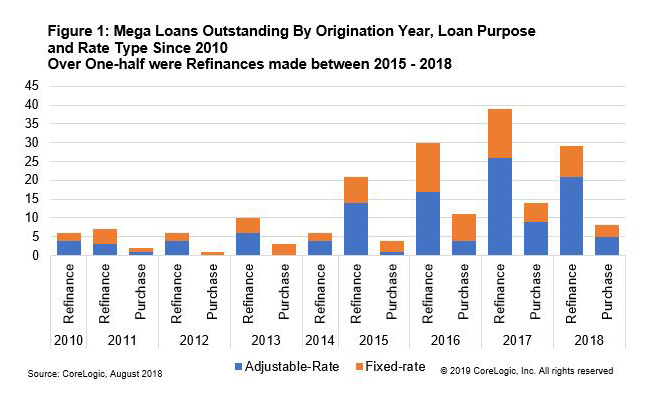 Lowering the rate wasn't the only reason these borrowers refinanced, rate/term refinances accounted for only 16 percent of the loans. Forty-seven percent qualified as cash out. The third purpose, consolidation, was behind 21 percent of the refinances. The cash out amounts tended to be large; on average the refinance loans were $6.6 million larger than the mortgages they replaced. That average jumped to $8.3 million last year. Where the borrower chose a fixed-rate, they tended to also chose a 15-year term. CoreLogic said three large banks accounted for the loans made to about half of the borrowers. Of course, if you have to ask, you can't afford it, but the P&I on a $15 million 15-year mortgage at 3.25 percent is $105,390.